A working prototype of the first ever Transparent LCD was showcased at CeBIT 2011, introducing a rather different and powerful technology while on the same hand making it energy efficient by powering it with Ambient Light. Samsung Electronics demoed the 46-inch LCD sporting a full HD resolution (1920 x 1080 pixels) with a full ten finger touchscreen surface. The transparent panel uses vertical alignment display mode, seen as an improvement on the see-through LCD panel showcased previously at the SID 2010 in Seattle, last year. The company introduced the transparent LCD panel which will introduce commercial models with home appliances being a potential application. While a company source confirmed on the innovative technology, a spokesperson denied on the solar panel to be used on other similar products. Surely, this move is praised by many as the company plans on cutting down power consumption by such a margin, as it introduces Ambient light. 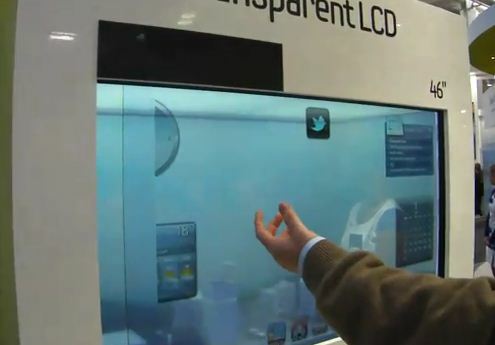 Furthermore, the company is eyed on building bigger size panels such as, Samsung’s biggest LCD panel, the 65-inch model.